ADVERTORIAL: Winter is on its way, and soon your house may be filled with sniffles, fever and the flu. 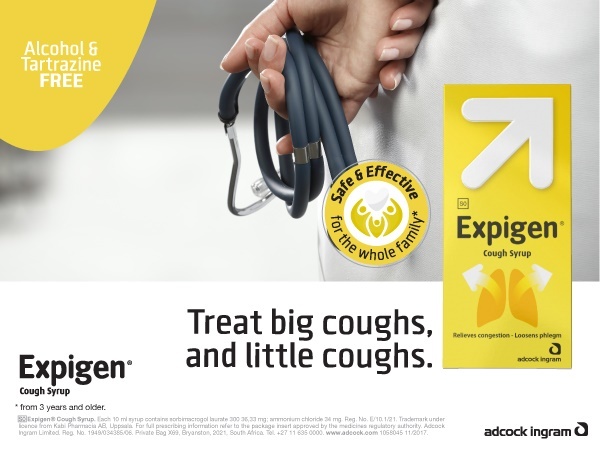 Expigen alleviates wet cough symptoms safely, for everyone. The trick to treating a cough is to understand what type of cough it is. Coughs are generally either dry or wet, and are either productive (produces mucus) or non-productive (doesn’t produce mucus). A wet cough is caused by excessive mucus in the lungs and airways and you may have difficulty coughing out the phlegm. It is important to select the correct type of medication for your cough to avoid the risk that you may make your condition worse. Expigen is suitable for wet coughs, as it contains ammonium chloride, which acts as an expectorant. This thins out the mucus so one can cough it up. Expigen is safe for the whole family to use and for children aged 3 and older. Expigen is the most recommended cough mixture by gynaecologists. S0 Expigen® Cough. Each 10 ml syrup contains sorbimacrogol laurate 300 36,33 mg; ammonium chloride 34 mg. Reg. No. E/10.1/21. Trademark under licence from Kabi Pharmacia AB, Uppsala.